Peripheral nerves are composed of nerve fibers: axons surrounded by a myelin sheath. Spaces in between are filled with parenchyma and vessels. Quantitative analysis of the components in nerve section is especially useful in neuroregeneration research. Manual methods are prone to human error, inaccurate and time-consuming. Our research presents a novel method based on digital image analysis in free and open software. Rat sciatic nerve fragments were harvested and fixed in a solution of 2.5% glutaraldehyde and 0.1M cacodylate buffer. Other steps included: wash in 0.1M cacodylate, postfixation in solution of 4% osmium tetroxide in 0.2M cacodylate buffer, dehydration and embedding in Poly/Bed812. Semithin sections were stained with toluidine blue and captured at 40× magnification. Preanalytical image processing began with artifact removal in GIMP (non-neural elements). Images were uploaded in self-design image processing macro in FIJI that included Contrast Limited Adaptive Histograph Equalization of the original image (CLAHE), 16-bit conversion, and another CLAHE (converted image as a mask). 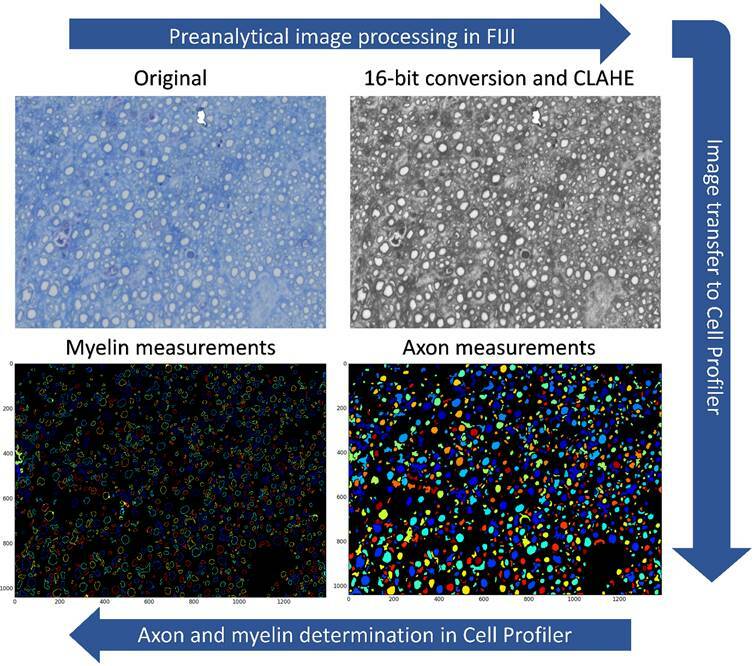 Processed images were uploaded into CellProfiler for automated axon and myelin sheath identification and measurement. This software pipeline was designed to automatically identify three sets of objects: primary objects–axons; secondary objects–nerve fibers; and tertiary objects–myelin sheaths. Axons were identified with adaptive Otsu thresholding. Next, the nerve fiber area was distinguished on an inverted input image by the Distance-B method with Kapur thresholding. Finally, the myelin sheaths were detached by subtraction of the axons from the nerve fiber. Sets of parameters were measured for both structures: area, perimeter, mean radius and Gratio. Results were compared with manual determination and measurements of 10 random nerve images assessed by 3 blinded researchers in FIJI. The designed protocol enables determination of axons with 87,35% coverage and myelin sheath with 74,86% coverage with manual technique (p<0,05). Example of image analysis workflow is presented in Fig. 1. Time needed to perform one image analysis in case of automated protocol oscillates around 3 minutes and manual technique takes ~93 minutes. Our protocol offers an attractive and efficient alternative for manual marking of axons and myelin sheath. This solution may be especially beneficial in neuroregeneration studies based on the histological image of numerous sections. Figure 1. Nerve scan image processing and analysis software pipeline.